It's hard to tell how many auto collisions are caused by drivers who talk -- or, powers forfend, text -- on a cell. Why? Says WA state patrol: "In a speed or DUI related crash, investigators have physical evidence they can rely on. But a crash caused by cell phone use or texting requires self-reporting by the causing driver. Only in the most serious collisions can troopers get a search warrant to examine someone’s cell phone." So what do those serious crashes say? The national safety commission says that hospital records indicates that drivers who talk on cell phones -- hand-held or hands-free, folks -- it doesn't matter -- are four times more likely to crash. And, says the NSC, thousands of deaths annually can be directly linked to cell phone use. That's thousands of people who might be alive otherwise. What if one of them was your mom? Or kid? I drive a car. I ride a motorbike. A bicycle. I also walk and jog in this fair city. I think I have some perspective. And I use my cell phone a lot. But not while I'm driving. Lives depend on me knowing exactly where I'm pointing my many tons of deadly steel. Studies clearly say that driving while using a cell phone is just as unsafe as driving drunk, hands-free or not. You knew that, right? I'm standing at a city corner, waiting to cross, cars streaming by me ignoring pedestrian right-of-way laws, and as I watch something like one out of every four drivers is on their cell phone. This is still a $125 ticketable offense. You probably know that if you're driving drunk and you kill someone, you'll go to jail for many, many years. But did you also know that if you're talking on a cell or texting and you kill someone you'll merely pay a fine for that killing? I think it's about $250. I'm not sure it ultimately matters what society does to you for killing someone accidentally while driving, because at that point your life is a massive mess -- because you've killed a human being. You've taken a life, without cause, without intent. It changes you. You can never, ever undo it. So tell me: what is so essential that it needs talking about while in a moving vehicle on city streets? What phone conversation is so critical that it can't wait? Why not pull over? What could possibly matter more than not accidentally hitting a fellow human? Cell phones don't kill people. People who are foolishly, stupidly, and lamentably distracted by social media kill people. 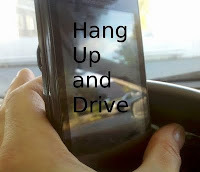 If you drive, hear my plea: hang up, pay attention. Lives depend on you. I read "Traffic: Why We Drive the Way We Do (and What It Says about Us)" by Tom Vanderbilt several years ago. It was a fascinating read, and it convinced me that I will never, ever, ever, ever drive while talking on a phone. And that includes hands-free. It's not about the dialing -- our little brains just get too distracting on the phone. It's a physiological thing, and it applies to everybody. I've definitely seen evidence of it, too. When I have had to jump out of the way of a car while walking downtown, the driver has almost always been talking on the phone. That would be one reason why I will never ever take my motorcycle into the city. Much fewer people talk on cellphones while driving on the other side, where I live. The other reason, the city itself is at least 10-times more distracting to my brain than a cellphone is to a normal person's brain. I don't want to hurt anyone (myself included), so I leave my bike on the other side and take public transit in the city. It is the responsible thing to do, people's lives are worth such minor inconveniences. Ari, I have to agree with you about Seattle drivers being worse than elsewhere. It's mostly (but not entirely) cell phones. I see a lot of disrespect, disregard, and rudeness. My memories of auto traffic even in NYC, which should be the worst of the worst, are that while drivers there were insane, they were keenly aware of what they were doing. It's the combination of distractedness and apathy that makes Seattle drivers so wretched. I hear that in Portland you get honked at if you're on your cell phone, that the popular Portland culture is getting intolerant. This is great news, and I hope the meme spreads to Seattle soon. Kudos to you for knowing your own limits. If only we were all that insightful and wise. Thanks for the comment.